I know, I know. Everyone knows how to make spinach dip, right? In fact, it just may be that you know how to make it the way I make it here. Maybe what I have here is not even new to you. But it’s new to me, and I’m excited to share it! Two jobs ago I worked with a girl who claimed to have the best spinach dip recipe ever. 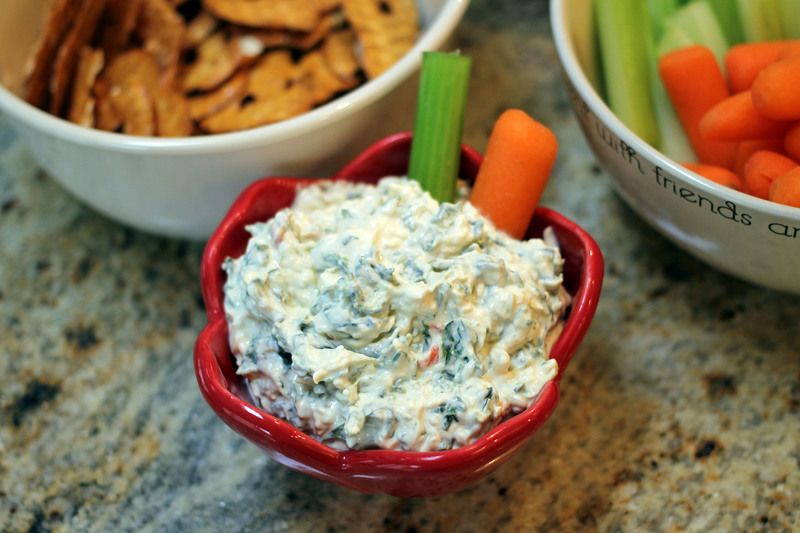 I love spinach dip – have all my life – ever since I was a kid that hated vegetables and anything green – so I said girl, bring some in and I’ll tell you if it’s better than my mom’s. So she brings it in, with a box of Triscuits. I say, why the Triscuits? She says, it’s the best way to eat it. So I try it, and doggone it, she’s right. I kept eating it, and trying to figure out what made it so different. Upon close inspection, it appeared to contain all the same ingredients as my mom’s dip. It mostly tasted the same. There was a slight difference I couldn’t put my finger on. But the main difference was the texture. It was thicker. More stiff. So I started grilling her. Bingo. The girl put cream cheese in her dip. Now to figure out the correct proportions! It only took me two tries to get it right. Sadly, I don’t talk to this girl anymore, we have grown apart and moved on with our lives, but if I did I’d let her know I cracked her secret spinach dip code, and thank her for introducing it to me in the first place. 1. In a medium bowl, combine the softened cream cheese, mayonnaise, and sour cream with a hand mixer. Beat for a couple of minutes until very well combined. 2. Add the vegetable soup mix and beat for another couple minutes. 3. Add in the wrung-dry spinach and hot sauce. (To wring dry: empty spinach into the center of a clean kitchen towel. Gather the towel up around the spinach and twist the towel together over a sink, and squeeze and wring until no more water comes out.) Beat for another minute or to to ensure it’s well combined.